Global phasing to maintain traffic throughout construction without the need for a temporary detour bridge as well as limit the impact on the recreational users of the Park. The former Northwest River Bridge consisted of a two simple span prestressed concrete girder, reinforced concrete deck superstructure, founded on a single in-river concrete pier and concrete abutments and retaining walls located at each end of the bridge. Repairs had been completed on the structure over its lifespan, however, in 2012 the owner decided to replace the structure. PWGSC issued a call for proposals for the replacement of the Northwest River Bridge in 2014. The project objective was to remove and replace the existing Northwest River Bridge in an efficient, cost-effective and environmentally friendly manner and to realign the approaches on each side of the bridge to current NL-DOTW standards. 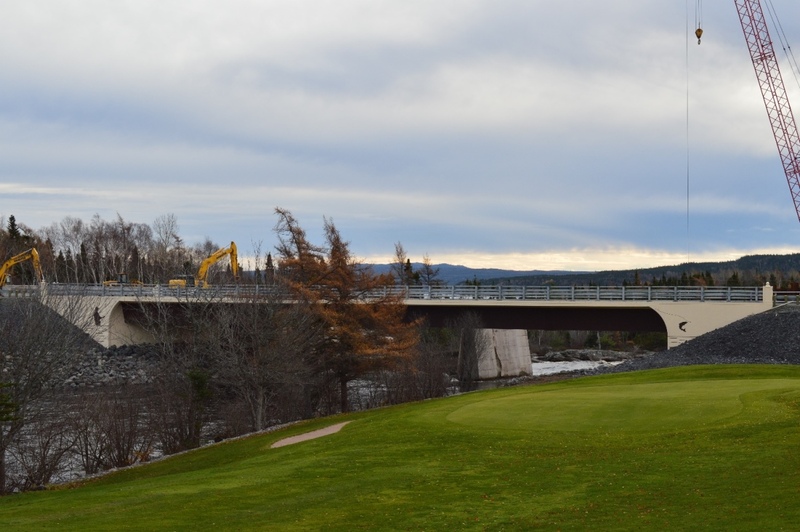 The bridge structure is located within Terra Nova National Park, adjacent to a golf course and spans the Northwest River at a popular fishing location. With this in mind, it was essential that the replacement structure and realigned approaches be aesthetically pleasing, blend with the National Park setting and incorporate elements that would distinguish the structure. After a preliminary design stage that evaluated several options, it was determined that a simple span twin trapezoidal steel box girder bridge, complete with a reinforced concrete deck system best satisfied the project objectives. The replacement bridge is a 61 m single span structure on a 20 degree skew with integral abutments founded on steel H piles driven to refusal in bedrock. HEC created comprehensive three dimensional finite element models to complete the bridge design, evaluate skew effects in the girders and bearings, and to determine seismic effects. The structure was built with a 900 mm offset from the face of the existing structure, allowing the existing structure to remain open throughout construction, thus eliminating the need for a detour structure. Because the new structure is constructed adjacent to the existing, it removed the demolition of the existing in-water pier from the critical path for construction, thus avoiding any delays to the schedule as a result of limitations placed on in-water work due to salmon migration. The bridge construction phasing was conceived in order to remove the demolition of the existing structure from the critical path since it requires in-water work which is subject to seasonal restrictions. The new bridge abutments are constructed adjacent to the existing approaches by the use of temporary sheet pile retaining walls, thus allowing traffic to remain on the existing structure. Upon completion of the new bridge, traffic is diverted onto the new structure and the demolition of the existing structure is completed. In addition to the river bridge design, HEC was also responsible for the design of the temporary sheet pile retaining walls along each approach and the phasing for the extension of the golf course underpass structure immediately east of the river bridge.